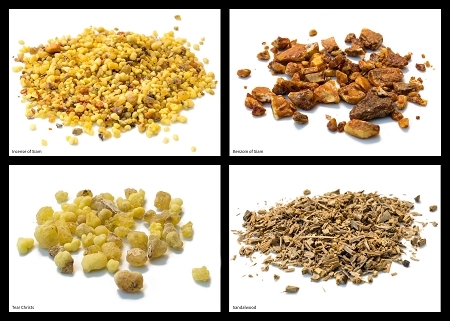 Benzoin has a long and rich history across several cultures. Ancient texts show that the Greeks and Romans used benzoin over 2000 years ago. Records inscribed on papyrus reveal that it was imported by the Chinese and ancient Egyptians via the Red Sea where it was ground into a powder then mixed with substances like juniper, pine, labdanum, and cypress to form incense. Egyptians made it into cones that were placed on the heads of dancers. The crude balsamic resin is extruded from the bark of the Styrax Benzoin tree native to Sumatra, Java, and Thailand. It is pourable in its essential form and amplifies sweetness and warmth in its applications. The calming fragrance is rich and woody with hints of vanilla, making it a popular base note in a variety of perfumes and incenses. Its uplifting characteristics are soothing to feelings of stress and worry and promote a sense of tranquility and stillness of the mind.